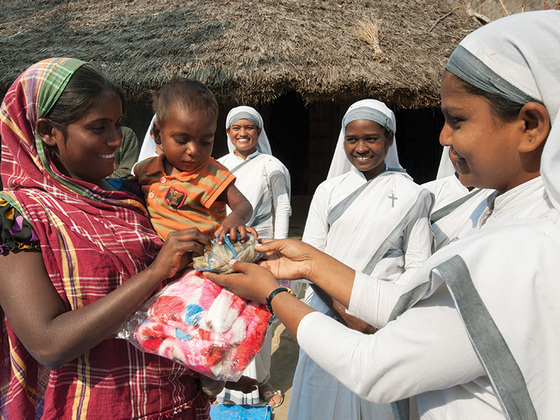 Sisters of Compassion in Asia stretch out loving hands to the helpless and downtrodden, ministering to their everyday needs. Most of 12-year-old Mareechi’s neighbors were poor and uneducated, like him. Many adults worked as laborers, street cleaners or garbage pickers, and some of the children did too. Although some kids could go to school, the majority spent their time roaming the narrow, refuse-filled alleyways, often picking pockets, swiping food and even sneaking into other people’s homes to take from their meager possessions. Life in the slum was never easy, never safe and never clean. Many people find themselves in slums when they move to cities in hopes of better wages. Others, like Mareechi, are born into them. But Sabita, Kala and Kuntal, three Gospel for Asia-supported Sisters of Compassion, traveled to Mareechi’s slum for another reason: They wanted to display the love of their Creator. They gave people practical advice about health and hygiene. They visited the sick and downtrodden. They held literacy classes to help women who never had a chance to be educated. And they started “Sunday school” classes on Wednesdays and Saturdays to help children like Mareechi discover a better way to spend their idle time. Above all, they prayed for God to touch hearts. During Sunday school, Mareechi didn’t interact with the other students. When Sabita, Kala and Kuntal asked him why, he told them about his health problems. An inexplicable dizziness and nausea often caused him to lose his balance and collapse. The same condition affected his mother, Pehr. Though the family often prayed to their gods and goddesses, and Mareechi’s hard-working father spent far more than the family could afford on doctors’ visits and treatments, neither mother nor son found healing, and their lives remained miserable. When the Sisters of Compassion found out about Mareechi’s condition, they responded with love and prayer. Overjoyed, Pehr found the three women at church that Sunday and told them what God had done. She came back week after week and started learning more about Jesus. It didn’t take long for Pehr to experience His grace, joy, peace and healing in her life, and she received the gift of becoming a child of the Living God. Her husband, witnessing God’s power in his family’s life, made the same choice. All this is made possible because God hears the prayers of His children—whether those prayers come from three Sisters of Compassion serving in an Asian slum or from your very own home. Thank you for your prayers for the people of Asia.